Rainbrew Slot Review | Microgamings colourful rainbow slot machine! 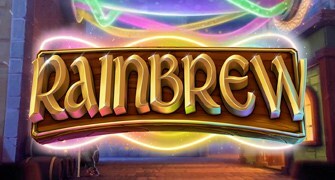 Created specifically for Microgaming, Rainbrew is a cheery, colourful new online slot machine game released in August 2018. Though it is an Irish-themed game, of which there are many, it has a different look to it than most of the others. This may be because Microgaming teamed up with another software company to create this title. Players will notice immediately that the game screen of Rainbrew does not look like that of most other online slots. The unique layout of the reels helps set the game apart from the competition. Like any other Irish themed game, this one includes symbols on the reels such as a barrel, a male and female leprechaun, rainbow coloured beer in a mug, and a pipe. The less important symbols on the reels include Celtic designs and logos. Players will notice that of the important symbols, certain ones are only ever seen on the bottom and top of the horizontal reels. In addition, the game also boasts wild symbols, yet where most games have one or two, this one has three. This includes the regular, top and bottom wilds, which are always found in specific places on the reels. The main bonus feature is the free spins. They are triggered anytime that a spin of the reels results in the scatter symbols showing up on reels two and four. Players will either get six or 10 free spins of the reels. The most popular bonus feature in Rainbrew is the Sidewinder. The highlight of this bonus feature is that it is played with 1125 or 576 ways to win. As a result, it is the bonus feature that pays out the most money to lucky players. The bottom and top wilds are what make this bonus pay out the most. It is hard for many players to resist the lure of happy-go-lucky leprechauns. This is one reason why the game is so appealing to so many players. Its Irish theme puts a twist on the traditional beers that one would see in similar games. Rainbow coloured beer that give the game its interesting name make the game itself equally interesting. Being visually entertaining, Rainbrew is as fun to watch as it is to play. With the auto play feature, anyone can sit back and watch the reels spin right before their eyes. For many players this, combined with the colourful beers and leprechauns makes the game compelling and keeps them coming back for more. For those who love Irish themed slots, this one definetly stands out from the others. As a brand new game, it offers a level of excitement that other games don’t. The game is visually appealing whether it is being played on a computer or a mobile device. Those that choose to play it on their mobile device will find that the graphics and gameplay are just as high quality. The video quality, combined with the music, makes the whole experience interesting to players. As a result, it is likely to have a long future ahead of it as a growing number of players discover it.